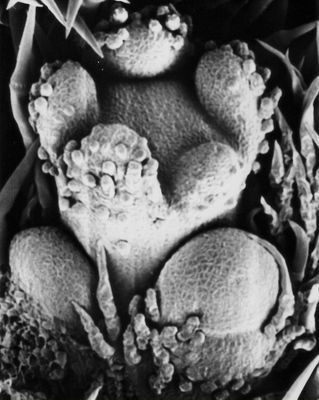 SEM-micrograph of early flower development in Sinningia bulbosa. The upper structure includes the early stage of five developing sepals; note two more flower primorida at the base. Floral development has been studied in some members of Didymocarpoid Gesneriaceae (Didymocarpoideae: Streptocarpus, Saintpaulia – now sunk in Streptocarpus, Nishii et al. 2015, Haberlea; Harrison et al. 1999, Citerne et al. 2000, Haston and Ronse de Craene 2009) and Epithematoid Gesneriaceae (Epithemateae: Monophyllaea, Epithema, Rhynchoglossum, Whytockia; Weber 1976b, 1977, 1978). Succession of floral organs follows the common pattern in Scrophulariales: sepals to petals (alternating with sepals) to stamens (alternating with petals) to carpels. Zygomorphy is expressed in different stages of floral development, either late (the young floral bud being actinomorphic) or early (with a dorso-ventral gradient obvious already in the emergence of the sepal primordia: Monophyllaea). Staminode primordia seem to be always present in the young flower buds: they emerge either at the same time as the stamen primordia (but later showing successive delay) or slightly afterwards. The fusion of the corolla lobes to a sympetalous corolla is late (late sympetaly), taking place by meristem incorporation and fusion across the backs of the anther primordia. The two-carpel primordia arise more or less simultaneously in median position. The individual form of the corolla is produced in the latest stages of floral development. Modern peloric hybrids of Sinningia speciosa, created by Charles Lawn of Australia. 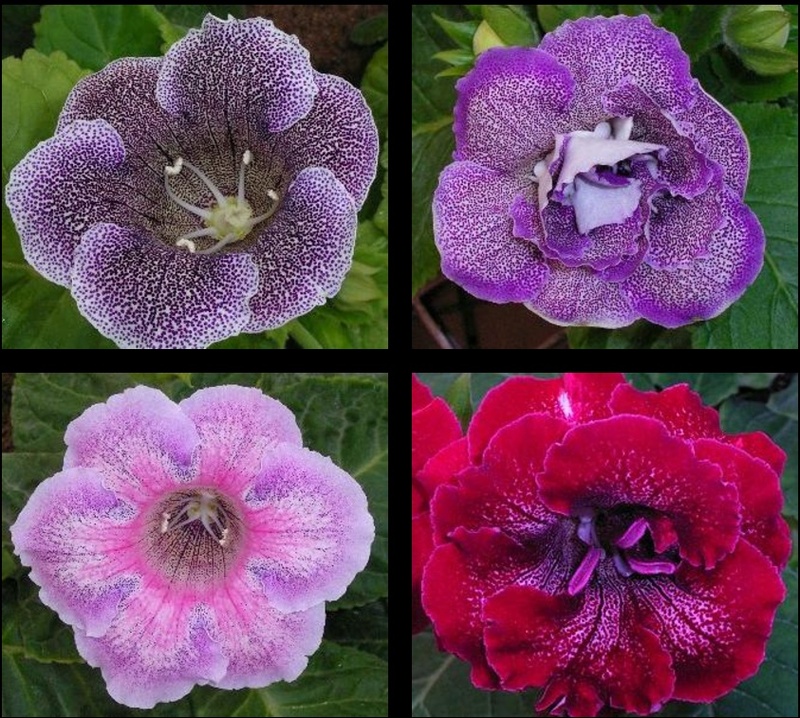 The flowers of Gesneriaceae (especially Streptocarpus) have long been the subject of genetic investigations, recently also combined with molecular genetics and systematics. A focus of interest is presently the genetic and developmental basis of floral actinomorphy (both in natural species and in peloric forms like the popular hybrids of Sinningia speciosa, the “Florist’s Gloxinias”) with the involvement of cycloidea-like genes (Citerne et al. 2000, Smith et al. 2004, Gao et al. 2008).